I hope you've joined me today by way of the wonderfully talented Hussena Calcuttawala, but if you haven't and you'd like to start the hop from the beginning, just head to the Spellbinders blog for the full lineup. I have a couple small gifts that I made up featuring the Kitchen and Handcrafted sets. I love the baking set with that gorgeous floral rolling pin and knew I had to break out some blender pens to do it justice. On a large tag, I stamped it repeatedly in a yellowish-green and then colored it in the with peachy-pink inks. To add some texture, I put a scrap of lace and ruffle trim along the lower part of the tag. I stamped the cupcake next and then filled that in with similar colors. I die cut it out and attached it to a glittery tag with foam dots for dimension. 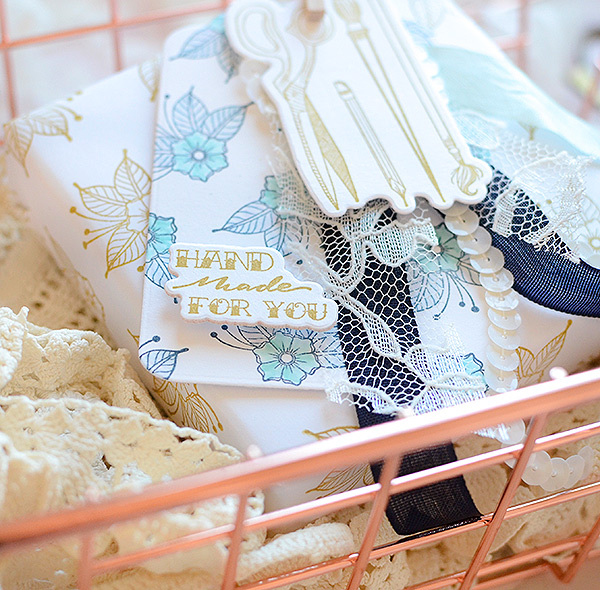 For the gift wrap itself, I covered a 4" x 4" box with peach crepe paper, more lace, and some bronze shimmer twine. I like a lot of different textures! I slipped the rolling pin tag under the twine and the cupcake and glitter tag over it. For my second package, I used the Handcrafted and Yarn sets, beginning with another large tag. I stamped a repetitive pattern of the pretty floral included in the set. I stamped it in a navy blue, then colored it in with a turquoise bloom and slightly purplish leaves. Next, I stamped and die cut the scissor and paint brushes image, found in the Handcrafted set. I also stamped and die cut "hand made for you" which is from the Yarn set. I actually stacked 2 of these together for a thicker look, and then added it to the lower left corner of the stamped floral tag. I aimed to create a layered tag, with the scissor/brush die cut as the top and the large tag on the bottom. Sandwiched in between the two is a handful of trims--lace, sequins, and ribbon. This time for the gift wrap, I used the floral stamp to create my own patterned paper, stamping repeatedly on bright white printer paper. It's one of my favorite techniques when I have small packages to wrap. I didn't use any extra trims here aside from what I included on the tag set itself. I adhered it all to the package with a mini clothespin. To celebrate this release, Spellbinders is giving away a $50 gift certificate to THREE lucky winners. Please leave a comment on the Spellbinders blog by Wednesday, February 21st 11:59 pm EDT for a chance to win. The winners will be announced in the blog hop post on the Spellbinders blog the following day. Oh my, what gorgeous gift packaging. 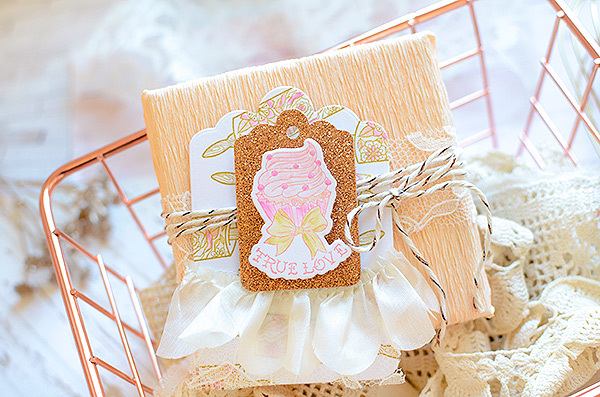 LOVE the crepe paper as wrapping, perfectly highlights your gorgeous tags. What stunning gifts these would be to receive! I love that you've left the stamps to be line art and not colour them in too much. The images are beautiful enough to stand alone. Gorgeous work! Rebecca, your package wrappings and topping tags are awesome. Thank you for sharing your beautiful ideas. You are an inspiration for this "Handmade" Spellbinders release. Your photographs are dreamy and your creations beautiful. 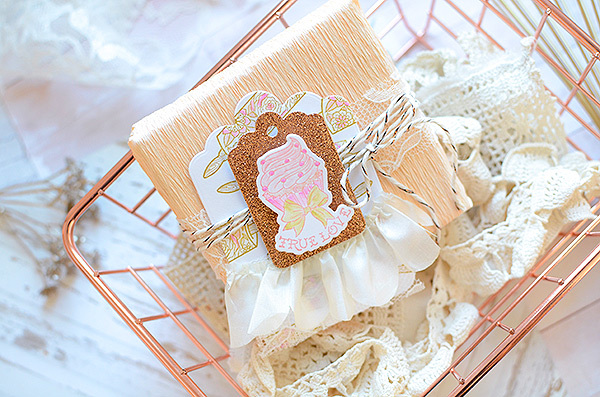 Pretty rustic gifts. So pretty! What gorgeous projects! Love the way you used the stamps/dies for the gift wrapping and tags. I love dancing up my gift packages to. This is such great inspiration. Oh my! You make such pretty packaging presentations! I love your coloring and all the layering and textures. 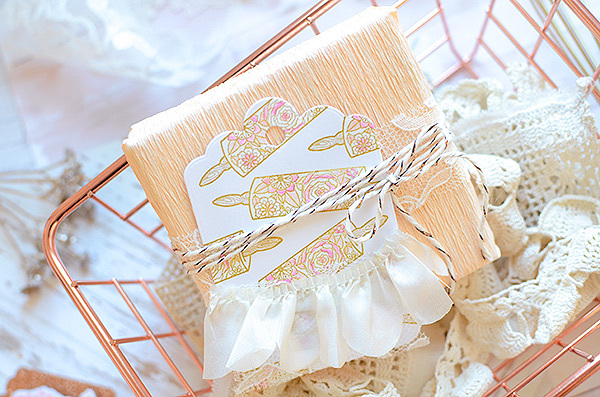 Those hand wrapped packages are so very pretty! Thank you so much for sharing. Your package wrapping is just beautiful! Spectacular! I especially love that you stamped the gift wrap on the second package but the first is also gorgeous! TFS! These tags are sooo pretty. What a beautiful way to wrap a gift. Almost too beautiful to open. Love your creativity with the tags. I really enjoyed the use of the lace and ruffled lace. The paper you made is beautiful too. 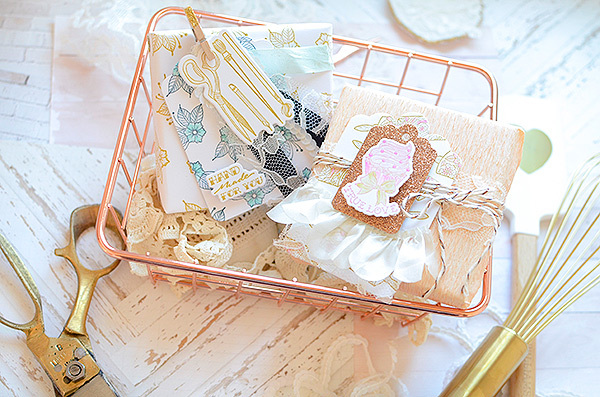 Wow, I love your gorgeous shabby chic designs with all the ruffly goodness! 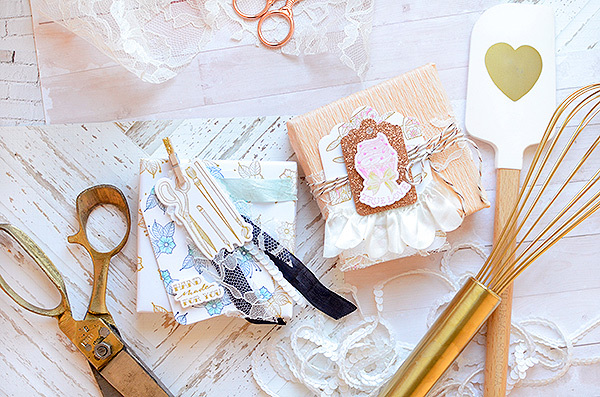 Very pretty ways to give gifts. These gifts are wrapped up so fabulously, the recipients are gonna love 'em! Rebecca, I am a HUGE fan of tags and beautiful packaging and you nailed it here. 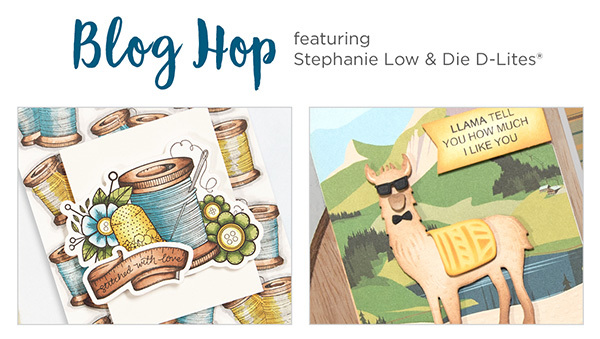 These are all so beautiful, I am loving Stephanie's designs a great deal. Beautifully done! It’s amazing how you take such humble products and make something so amazing! Absolutely beautiful! 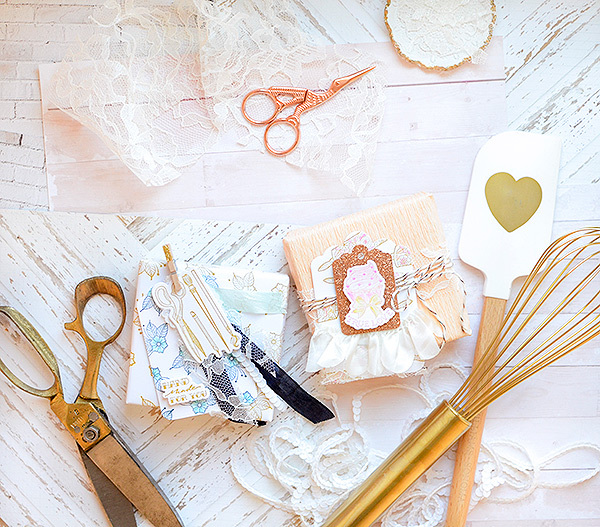 Such an elegant and lovely way to package a gift! Your tags and wrapping paper are amazing. I definitely would not want to open it if I received it! Such pretty little packages. I love that rolling pin. Such a amazing way to personalise gifts. Thank you for sharing. Wow... What a great way to personalize gifts.. great idea..
What a super gift wrapping idea. I can't wait to try the next time I need a present. Thank you for sharing. The themes for these tags is really pretty. Very nicely done! The colors you used are beautiful. 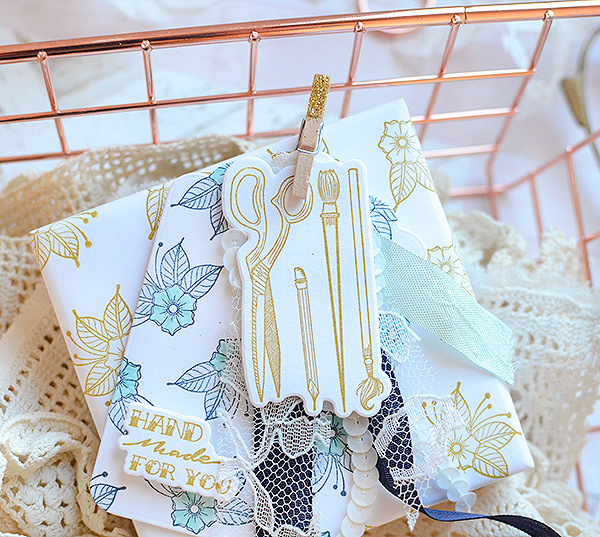 TFS your pretty cards and gift wrap. Wow lovely packaging inspiration. Love this release! I really enjoyed seeing your projects. These are such great ideas. Thank you for sharing. Always ADORE your gorgeous projects Rebecca! Very unique, and love the thought of kitchen and art. Love how you add ephemera! Those are beautiful! Thank you for the inspiration! Such beautiful presentation of a gift! Your tags are so beautiful and creative! They're tiny works of art. You've really inspired me. 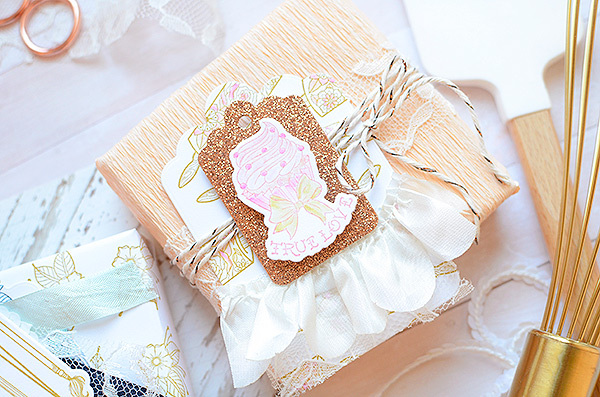 Gorgeous tags and gift wrap - thank you for these great ideas for creating such pretty packages ! You created such beautiful projects. The tags were gorgeous on each package. Thanks for sharing.. These are just so lovely - and I love the colours you chose. So delicate! Great wrapping projects. great inspiration. Fantastic, thanks for the inspiration! Your creations are so feminine and delicate ! So beautiful!!! I love your sweet wrapping ideas!! Oh, these are so pretty and elegant. Love the vintage look. The trims and lace pieces look gorgeous! 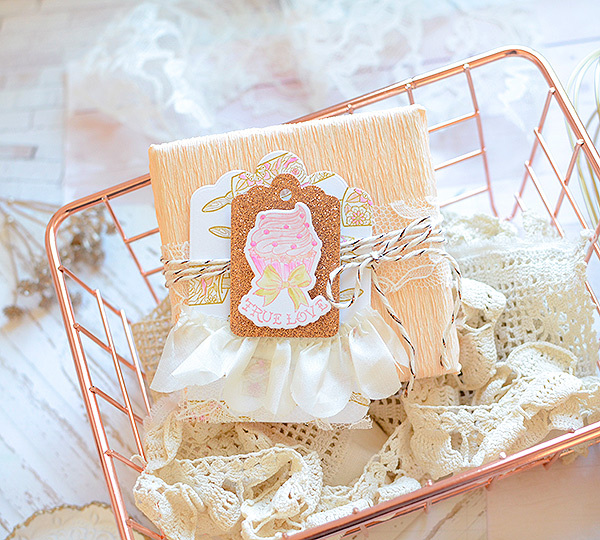 Lovely tags and packaging! 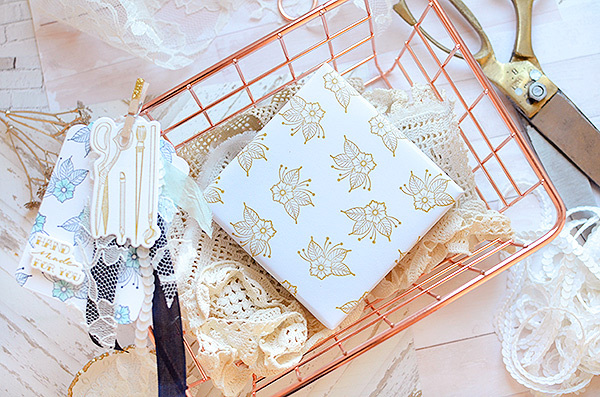 I love the idea of stamping some plain paper into gift wrap! your ideas and creations are always so unique!! Very pretty!! I love the wrapping paper with the crepe paper. Very unique! I really like the delicate look for your tags! Super job! 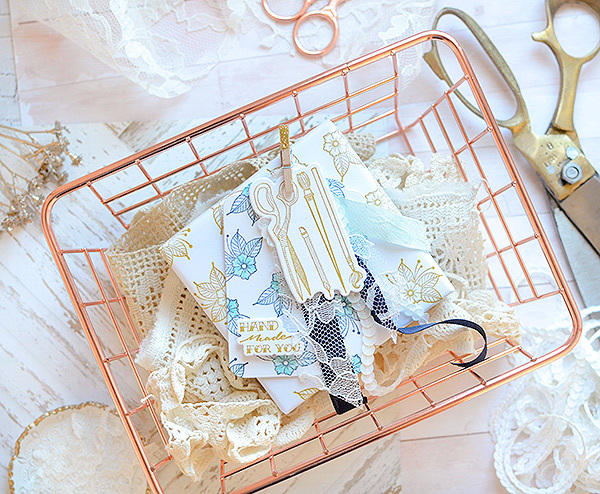 Girly tags are the best! All of that texture is great.